I recently attended The Veggie Fest in Naperville and talked to a person advertising the health benefits of a native berry called the Black Chokeberry (Aronia melanocarpa), a plant he claimed no one around here knew about but was very well-known in Europe. I smiled under my breath because I commonly use this beautiful native shrub in my landscape designs. I did an Internet search of “aronia melanocarpa benefits” and found many interesting websites claiming its high concentration of flavonoids and antioxidants. I don’t know about the data presented on these websites nor can I recommend them but I just wanted to share this interesting information with you since many of you have these shrubs in your landscapes. One thing I do know is that the berries are edible but very tart even when ripe ( dark purple/black in color), hence the name “chokeberry”. 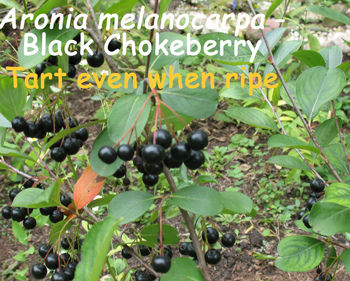 As with all plants, do not eat unless you are sure of it’s a black chokeberry. Birds typically eat the berries in winter but some of my clients have mentioned that birds have eaten the berries from their shrubs during the summer. I just recently tried some berries I harvested from my yard on ice cream and the combination was delicious (but just about anything on ice cream is good). The person I spoke with at Veggie Fest also suggested trying the ripe berries in cereal, smoothies, pancakes, or vanilla yogurt to offset the tartness (after washing them of course). Don’t forget to leave some for the birds!